Mildred L. "Millie" Speer, age 80, of Margate City, NJ, formerly of the Cardington section of Upper Darby, PA, passed away on August 26, 2018. Born in Darby, PA, she was the daughter of the late Arthur and Elizabeth Jackson (nee Riley). Millie had been employed for Claridge Hotel and Casino in Atlantic City, NJ. Millie was a huge Philadelphia Flyers fan holding season tickets from 1967-1981. She also loved watching tennis. Millie was predeceased by her beloved husband, William James Speer. 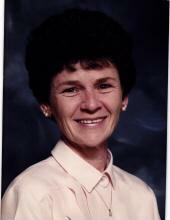 She is survived by her loving children Colleen Speer, William Speer and Michael Speer and her sister, Ruth Kelly. Interment at Arlington Cemetery, Drexel Hill, PA. In lieu of flowers, contributions in her memory to Compassion Care Hospice Foundation, 248 E. Chestnut Hill Road, Suite 4, Newark, DE 19713 would be appreciated.